Stitz's (1911b) description is at . 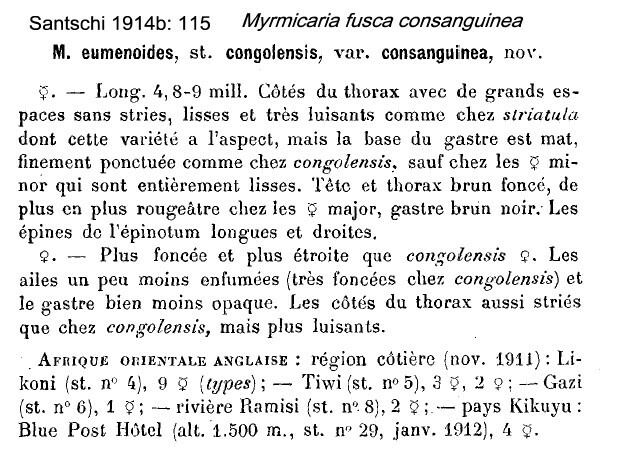 Santschi's (1914b) description of consanguinea is at . Arnold's (1916) description of nigerrima is at . 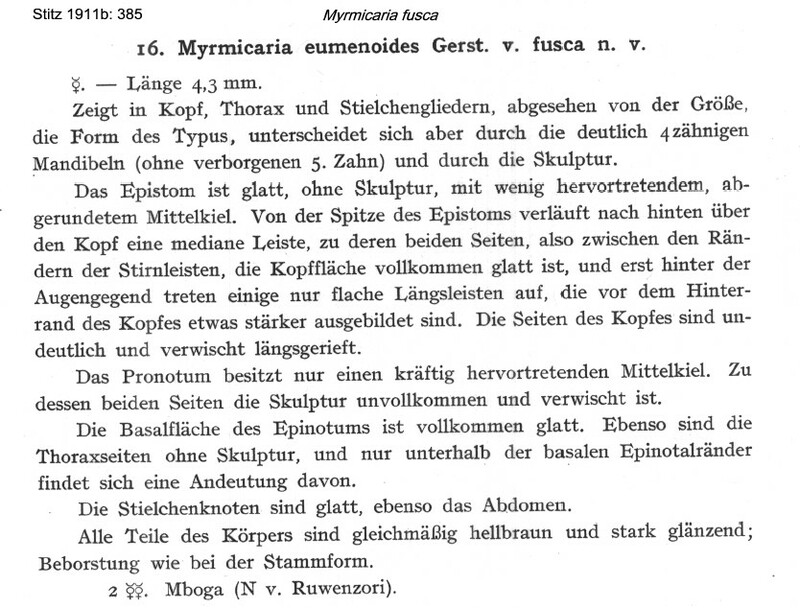 Santschi's (1925c) description, with consanguinea and laevifrons, is at . Probably purely from eastern Africa with the Za飏e being from the border area with Uganda, i.e. east of the Congo Basin. 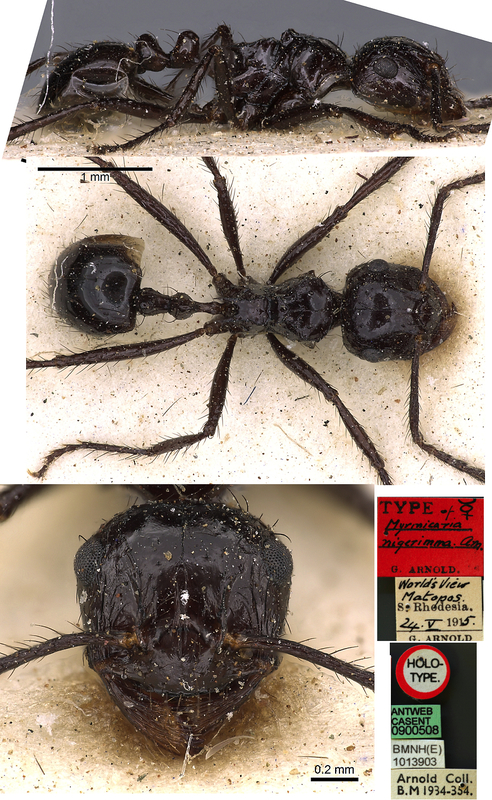 The photomontage of the nigerrima holotype is collated from http://www.antweb.org/specimen.do?name=casent0900508. Santschi (1925c) noted this as more truly (franchement) black and with sharper rugae on the genae. The colour variation, however, appears to be the major difference between this worker and those from Tanzania shown below, although, as Arnold wrote, this is less sculptured, notably on the lateral alitrunk. The photomontage is of a worker from the Usambara Mts, Tanzania, Amani NR, Zigi Lodge, S x皔' E x皔'; 2200 m; collector V. Grebennikov; 9-11.x.2002. Note - the specimens from Zigi Lodge are both larger and have more rugose sculpturation on a shiny ground than indicated in the published descriptions. It seems possible, but unlikely, that they actually are Myrmicaria rustica which also is known from Tanzania and was described with TL 7.5-8 mm. 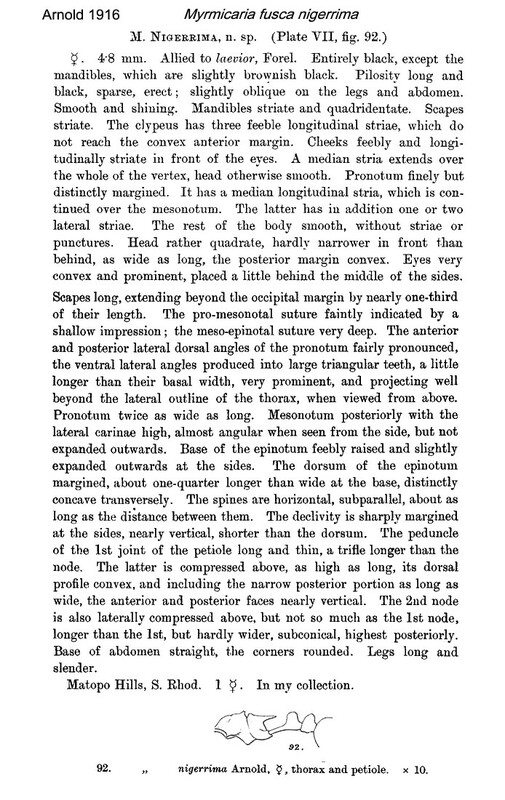 Santschi's (1925c) description of rustica is quite explicit on the petiole shape, etc. and these are different to the Zigi Lodge specimens. The consanguinea form was reported from Kenya and Tanzania, Amani (Santschi, 1925c).